Here’s the lowdown on the great-looking midweek club in the centre of Leeds. 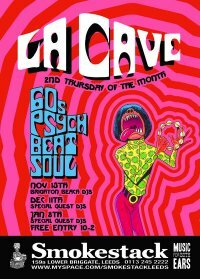 La Cave is a monthly shindig pushing 60s beat, r’n’b, soul, garage and psych on the second Thursday of each month (next date: December 11th). Resident DJs are well-known faces Rich Evans and Andy Steingold, with a guest joining them behind the decks each time. This month its the turn of Eddy Wainwright (Brighton Beach). If you are on Facebook you can join the La Cave group here. Don’t forget to say that it was the Modculture recommendation that brought you there!